Words cannot describe the black hole in our hearts that his leaving us has created. The last days of his life he was no longer the happy dog he used to be. It was time to let him go. He has terminal cancer. Earlier this month, both of our dogs started coughing a lot, probably some virus they caught at a dog play (they were both vaccinated for kennel cough). Wondering if they were fighting infections as well, Ann felt their lymph nodes. Jasper, our Boston, felt normal, but Lucifer Sam’s right lymph node seemed swollen. We took him to our vet where they took a fine needle aspirate of the lump, but the results were inconclusive. They sent us to the University of Wisconsin Veterinary Hospital, and discovered that he had a malignant melanoma which had started behind an upper molar and spread to his lymph node. The molar was removed, along with a bit of jawbone surrounding it, as well as the lymph node and some surrounding tissue. Unfortunately, the margins of the excised area were not clean, meaning that cancer cells were left behind, and will most likely regrow in the near future as this is an aggressive form of cancer with a poor prognosis. He spent two nights in the hospital, where he recuperated very well and probably won the hearts of the people there. He is at home with us now. We take him back to get his stitches removed next Tuesday. Each day he gets better and is more active. Even the first day he came home he tried to spin for his food as both he and Jasper do (we didn’t train Lucifer to do this, he just taught himself, and Jasper learned from him). But we realize that even though he may come back to normal and make perfect multiple 360s before every meal, that will be short lived with this horrible disease. The doctor at the UW told us that Chemotherapy does not respond well with this form of cancer. The other options are an experimental vaccine which is very expensive with only a 20% rate of success, and radiation therapy, which sounds like a horrible ordeal to put a 10 year old dog through. We will try to give him as much comfort as possible in his final weeks, months. or wishfully, years. Stan is concocting dog biscuits for him that are high in anti-oxidants (made with Aconia berries) which might inhibit cancer growth. We will remember the fun times at Pug get togethers and dog parks, where he happily joined in on running herds of Pugs with his “squeakbarking” and his constant food begging when anyone brought out the treats. We’ll remember how he loved to travel with us when we went to Colorado, like all the dogs we’ve had. And mostly we’ll miss his velcro-ness, a constant companion to Ann when she tried to work during the day (sometimes having to extract him from her side and relocate him to a different place to sit so she could work) and to Stan on the couch/futon in the evening, loving to snuggle under blankets. It seems too brief of a time to have had such a wonderful dog. 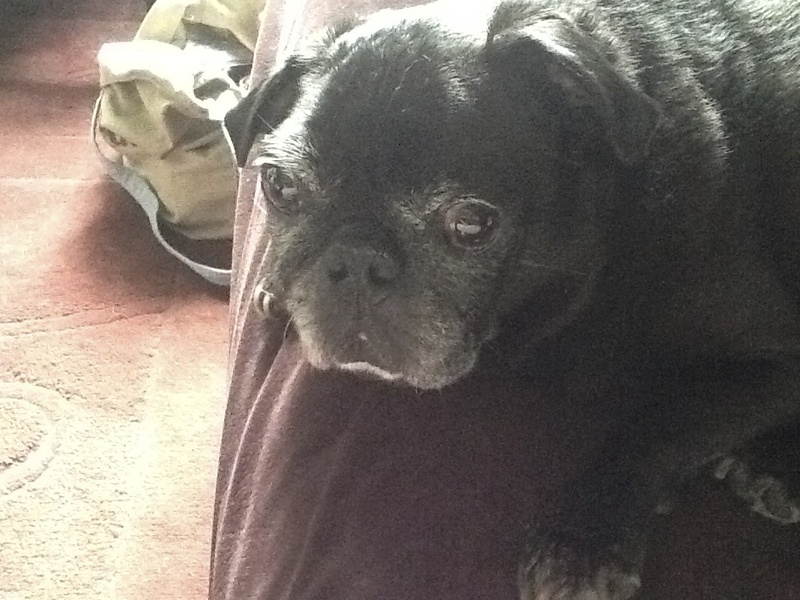 It was February 17, 2003 when we lost our first Pug, Hieronymus. And only May of 2010 when we lost our first Boston, Plato. This is too short of a timespan for hearts to heal. If Lucifer Sam hadn’t come down with a cough and Ann hadn’t felt his throat, the progression of the cancer might have been worse. We do not know how much longer he will be with us, and we will appreciate every remaining minute of his life. Again, an even more boring video of Lucifer Sam and Jasper at the Token Creek Dog Park the other day. Warning: This will be boring unless you love watching dogs being dogs. Warning: Unless you really get into watching a Pug and Boston run around at a dog park, this video is really boring. You have been warned. Lots of bad dreams lately. The anxiety of the world must be getting to me. After being a pet owner for many years, one of the questions I start asking myself as soon as I get a new animal and name it is: “what will its nicknames be?” Nicknaming is an organic process that just evolves. It’s not like naming your animal, which has been a much more thought-out process, usually dependent on the many interests and activities in our lives, like with the dogs. Hieronymus: art (after Bosch); Plato: philosophy; Lucifer Sam: Pink Floyd (the song); and Jasper: decorative stones. The cats’ given names had stranger beginnings. We got a small iguana shortly before we got our first cat. We named it “Boris.” I don’t know why. So we named our cat “Natasha.” To go along with the Russian name theme, our next cat that we got six months later we named “Vladimir.” After we lost Vladimir, we ditched the Russian theme in favor of classical antiquity. But we stuck with the brutal bloody ruler theme with our next cat, because it makes for a sweet cat. Go figure. And it did, hence, Caligula. Well, we also chose that name because of the little boots. Then came Apollo, again classical antiquity, and we chose the name for his bright sunny yellow color and Leonine sun sign (born August 1), like a sun god of the same name. Nothing to do with 1960s space flights. But nicks just happen. We usually can’t control them, because some of the nicks are almost embarrassing. Or downright odd. Some nicks get applied to all animals, like “Nutty Buddy.” And some nicks are sacred–like Pappit. Pappit was Plato’s nickname. Sometimes we referred to him as “The Pappit” when talking about him. Other times we addressed him by “nickname” and called him “Pappit-dog.” Plato also had other nicks like “Pippy” or “Bunny Monkey.” I’ve called Jasper those. But no matter how much Jasper will sometimes remind me of Plato, I will never intentionally call him Pappit. There was only one Pappit, and he is gone. Jasper will probably be the only “Little Boing Boing…but I don’t know. Maybe another Boston in the future (if there is one…if Jasper doesn’t outlive me) might be bouncy too, and inherit the Boing Boing nick. Getting close to the end of the Jasper Colorado videos. I think there’s just one more after this one. Yesterday Jasper got neutered. Of course his mom and dad were worrying a lot before and during the procedure. We worry so much with each pet we get (except for Apollo because he came neutered and declawed). Actually, I think we worried the most with Lucifer Sam. I was pretty much unable to do anything while he was being fixed. But unlike Jasper, Lucifer Sam had to have five teeth removed because they were crooked and crowded and causing problems with other teeth. Jasper only had five adult teeth that came in on top, so we were concerned that there might be another tooth hiding somewhere, which would require surgery. They took x-rays, and found everything normal–other than he only had five adult teeth on top–so no oral surgery was required, fortunately. After Lucifer Sam was fixed, we had wondered where our Pug went, and who was this new solemn Pug they sent home with us. He stayed that way for a day or two. Jasper, on the other hand, bounced back (literally!) quite quickly, probably because he didn’t have the oral surgery to contend with. I have him in his crate now to get more rest. After he did a couple hours of constant whining when he first came home yesterday, probably due to an anesthesia hangover, he was running around and chasing Lucifer Sam and being a spaz just like normal. This morning when I let him out of his crate, he was jumping up on me and acting so happy to see me. I had to steady him down to stop him from jumping so he wouldn’t hurt himself in the operated area. After I let him in from pottying outside, he ran like lightning into the living room to retrieve his new purple octopus toy that we got him as an after-surgery present, jumped up onto the futon, ran down the hallway, all before I could even get his Rimadyl (doggie painkiller) out of the bottle. Too much energy for a dog that needs to settle down so as not to aggravate that vital area. Again, here is another video from the Colorado trip. I’d like to dedicate the first part of the video to the Tea Party politicians. You’ll see what I mean. Lucifer Sam and Jasper chase after each other and the weird blue ball…chew…play…thing. Then there’s a chewtoy wardrobe malfunction at the end. Cut. Jasper digs for truffles while Lucifer Sam hops in place, but no one chases the weird blue combination ball/chewtoy hybrid playthings that they were fighting over before we started recording. The next set of videos I’ll be featuring will be of Jasper and Lucifer Sam playing in the backyard at my Mom’s in Colorado. I don’t know the exact dates…I think we recorded some on the 8th of August, and then again the 9th, so Jasper would be about 3 1/2 months old. The 10th is when we went up to Rocky Mtn. Nat’l Park, when my computer died, so I’m not sure if there were any more videos after that. Stan chose not to make any more movies without the ability to download them to both our MacBooks. Back in the good old days when The Internet Gave You Stuff, I had accumulated a bunch of points just for having a popular site on GeoCities, which earned me points I could redeem at various places like The Museum Shop (I got jewelry and decorative glassware) and The Sharper Image, which had these crazy little old school electronic toys called “WeeBots.” I don’t know why I got a bunch of WeeBots, but they are rather fun for animals. Their batteries are wearing out, and some of them don’t work as well as they did ten years ago, as you can see from the movie. But they do elicit some fun expressions from the pets. I don’t think Caligula is in the movie…he’s the oldest animal now, and he’s seen it all before. I’m guessing Jasper was around 3 months when this was taken. This movie was recorded probably when Jasper was about 12 weeks or so. Lucifer Sam would always spin for his food. I don’t know why–we didn’t teach him this. It just comes natural to Pugs to spin. For our first Pug, Hieronymus, we put the spinning on cue, so when we said “Bagel,” he would make donuts. Plato never danced for his food. He barked a lot. Sometimes he stood up as the foodbowl headed his way, but never danced. When we first got Jasper, he just sat and watched as we prepped his food. Such a well-behaved dog. But then he started picking up on Lucifer Sam’s spinning. He could not spin like the Pug. His dance was sort like crossing a spinning Pug with Elaine’s (Seinfeld) dance. Sort of spastic and uncoordinated. This is the early version of the Jasper Dance. Some time I’ll record his more recent version. He’s developing a style. Here’s another movie I took of Jasper when he was about 8 weeks old. I don’t have the exact date, I think I lost that info in the great computer crash of 2010.